Prayer for the Church, the Civil Authorities, Etc. St. Alphonsus Rodriguez was a cloth merchant in Segovia, Spain, he was married and had children. Following on the death of his wife and children, he lost his shop, and due to financial misfortune, became a thoroughly confused person. He prayed and was inspired to become a Jesuit. He was found too old to study for the priesthood and too weak to take up a lay brother’s work but the Provincial boldly admitted him, remarking that he was receiving him for his holiness. He proved right. A little while after his first vows he was appointed porter or door-keeper of the Jesuit college at Majorca and for the next forty years he remained at the same post. It was patient humble work for hours on end, daily walking up and down, taking messages of visitors and students and distributing alms to the poor. He was an influence for good to the hundreds who met him. He spent his time in quiet prayer and meditation, and towards the end he lost even his memory and could only say, “Jesus, Mary”. On October 31, 1617, surrounded by his Jesuit brothers he died. Historically today is his feast. 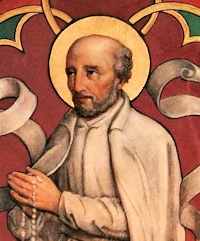 Saint Alphonsus Rodriguez was born in Spain in 1531, of a well-to-do commercial household of Segovia, the third of eleven children. When Alphonsus was eleven years old, he and his older brother were sent to a Jesuit college which had just been founded. He had already manifested great joy in serving the Jesuits when they had given a mission in Segovia and lodged in his father’s country home; now he rejoiced in the one year of study he was able to undertake, before the death of his father interrupted these pursuits. His brother, after certain affairs were settled, returned to school, but Alphonsus was obliged to remain at home, destined one day to replace his father. He accepted this lot and in 1557 married a virtuous wife; they were blessed with a daughter and two sons. But God intended to sanctify this soul of predilection by great and heroic sufferings. Only five years later he was already a widower, with only one little boy of three years remaining for him to raise. He believed this calamity must have come upon him for his sins, and he developed a great horror of sin; he asked God to let him bear even the torments of hell here below, rather than fall into a single mortal sin. He offered himself entirely to God, for whatever He might desire of him. Then he began a life of severe penance. A year later his mother died. He looked at his beautiful and innocent child, the only bond which still attached him to the earth; and he prayed to God that if ever that child should offend Him, to take him at once. His prayer was granted before long. Alphonsus left Segovia and went to Valencia, where a Jesuit priest he had loved and admired earlier in Segovia was then stationed. This priest helped him to attain a loving confidence in God. He was thirty-eight years old when he requested his admission to the Order, but insufficient instruction and his unstable health, affected by his austerities, were regarded as obstacles. For two years he was employed as a preceptor of the young by two families of that city; finally, when he renewed his request for admission, he was accepted. His religious life was spent primarily as a porter in a Jesuit college on the island of Majorca; his interior life was a succession of moral tortures, borne with perfect humility and love of God. The demons would not leave alone this holy man who made it his joy to take upon himself all the most humble and fatiguing offices. He cast himself, as it were, into the abyss of the love of Jesus Crucified. Twice he was thrown down a cement staircase by the adjured enemies of man’s salvation; but his love for his crucified Saviour was proof against all such attempts on his virtue. He was afflicted with various illnesses, which plunged him into a sort of preliminary purgatory but did not change his life of effacement and service. 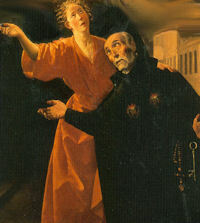 The story of his association in his old age with Saint Peter Claver, the novice whose future mission he saw by a vision and foretold to him, is written into the annals of the Church in letters of gold; the two Saints were canonized together by Pope Leo XIII after more than two centuries. Saint Alphonsus died in 1617; already he was known and loved as a Saint by the population. In 1825 he was beatified, and in 1888 Pope Leo XIII closed the inquiries after two new miracles had been verified, and proceeded to the ceremonies of canonization in Rome. The memory of Saint Alphonsus remains in benediction in the Order and in the hearts of those who know the value of the Cross of Christ and its perpetuity in His Mystical Body.